On our short trip to Bangkok in April 2009 we went to the Aquarium at Siam Paragon. At the basement floor of the Paragon shopping mall is the Siam Ocean World located, the best way to reach this sight in Thailand’s capital is by Sky train or taxi. You will see the huge center from the “Siam” Skytrain station. The entry fee was 850 Thai Baht for one person, the fee for kids and locals are less. For a scuba dive at the aquarium with the shark starts at 5300 Baht for one dive including a guide if you have a scuba licence. Without it is a bit more expansive. The Ocean World has many different tropical and colourful fishes, crabs and jelly fisches from many regions of the world but the main attraction are for sure the shark tank with a lot of eagle rays and of course many different sharks. The underwater mermaid shows are the highlight for the kids, and the dive with the sharks is the right choice for dad. If you decide to visit this sight of Bangkok you and especially your kids will enjoy this attraction. After the visit at Siam Ocean World you can go shopping at the big shopping mall Siam Paragon, one of Thailand’s big luxury malls at Bangkok. The Aquarium is a nice option to forget the bad air and the busy roads of Bangkok. Take a stop here and dive into the deep ocean direct in the center of thease Southeast Asian capital without getting wet. 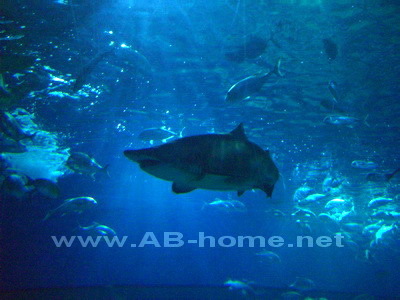 Siam Ocean World are a good option for families to spent a great day here at this Asia metropole.